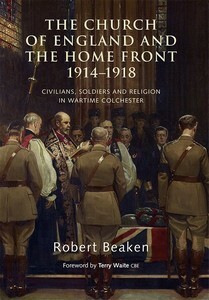 Review of Robert Beaken, The Church of England and the Home Front 1914-1918 (Rochester, NY: Boydell and Brewer, 2015). Pp. 272. ISBN: 9781783270514. Colchester, fifty two miles north-east of London, has been a garrison town since the days of the Romans. During the First World War its military establishment was vastly expanded, including four major army hospitals where the casualties from the battlefields in France were treated. The impact of the war was immediate and very visible. Colchester’s Church of England parishes were quickly and significantly involved, as is described in Beaken’s insightful and well researched account of these critical years. Colchester’s social elite, which was well represented in the Church of England parishes, was conservative, nationalist and hierarchical. Its members supported the British government’s decision to go to war in August 1914 for moral as well as political reasons. They joined in the widespread campaign urging young men to join the armed forces, until conscription was introduced in 1916, rendering such appeals superfluous. Thereafter the leading men set an example by supporting campaigns for contributions to the War Savings Bonds, while the church ladies were very active in ministering to the troops training in Colchester and to the wounded. Church people were assiduous in providing hospitality to the troops, and at least thirty five social clubs were established where recreational facilities and food were supplied, often at little cost. In part such provision was seen as a Christian virtue, but, as Beaken notes, in part it was inspired by the desire to keep the soldiers out of public houses, and so to keep prostitution and its attendant problems at bay. The clergy’s position was more problematic. At first many of the younger clergy had felt drawn to join their parishioners by volunteering to serve in the ranks, which they believed would be a means of getting to know their fellow men better. But the bishops soon asserted that such notions were incompatible with their ordination vows. Instead they were to remain in their parishes where their services, because of the shortage of army chaplains and the extra requirements caused by the war, would be all the more demanding. In fact, in Colchester, both clergy and laity soon recognized the need for extra pastoral witness to the many thousands of young men passing through the garrison on their way to the western front, or to those returned to Colchester for treatment in the hospitals. They were also called to officiate at the funerals of those who died from their wounds, and to comfort their surviving families. After the initial euphoria of the early months was replaced by the grim horror of the devastating and depressing stalemate of the Flanders trench-warfare, the clergy’s often self-imposed role in support of the war effort became more dubious, and even counter-productive. Since it was they who often had to bring the dreaded news to the families of men killed in action, their pastoral skills were increasingly honed to the presence of disaster and death. In the aftermath of the war, particularly in the 1930s, there was a widespread revulsion against all those, including a few prominent clergymen, who had so eagerly preached militant sermons in favour of the war effort. And inevitably such skepticism and resentment was turned against the religion these clergymen were upholding. The contradiction between the slaughter of so many of “the flower of the nation’s youth”, and the message of love and peace as contained in the Christian gospels was too glaring to be easily overcome. Understandably, Beaken does not try to answer the question posed by almost everyone at some point during the war: “Why does the Christian God allow such a devastating catastrophe to take place?” Instead he takes issue with some of the post-war writers, particularly those who misrepresented what actually happened and instead promoted their own interpretations for anti-war or pacifist reasons. For example, he dismisses the view that the ordinary workingman, who had volunteered for army service, had been seduced by bloodthirsty clergymen and subsequently was misled by glory-seeking and incompetent army leaders. So too the charge that the Church of England chaplains were too cowardly to go up to the front line needs to be refuted by the fact that such postings were forbidden by the military leaders. It is certainly true, as Beaken admits, that, despite the almost universal support of the war effort at the time, in later years many people came to feel that the senseless and degrading conflict in the Flanders mud had made the proclamation of the Christian gospel irrelevant. But the evidence here produced for the war-time conditions in Colchester would seem to prove the opposite. Church attendance remained almost the same throughout the war years, as did the number of confirmations. The overwhelming support given to the erection of war memorials, and the sincere participation at Armistice or Remembrance Day services for the remainder of the century and beyond, would seem to disprove the contention that the Church of England had a ‘bad’ First World War. Beaken disputes the myth that things were never the same after 1918. He points to the fact that in the vast majority of parishes the Church’s witness with its emphasis on Mattins on Sunday morning remained unchanged for a further fifty years. But he agrees that, in Colchester, as elsewhere, when the fabric if the city’s close-knit, inter-dependent society came apart, so the Church of England came to occupy a peripheral position. But this does not contradict Beaken’s central argument that the Church of England fared significantly better during the First World War than has been understood or acknowledged for much of the past century.